December 2004~ I brought Zackery home. Started with lots of ground work. He is very sweet and friendly but he first needed to learn respect and not to run up to and rear up to play with a human. I did put a saddle on him this month. He acted as though he had been saddled all his life. I put a winter blanket on him for the first time and he acted as though he has always had one. You can sack him out with anything and he is not afraid at all. Nothing seems to bother him. 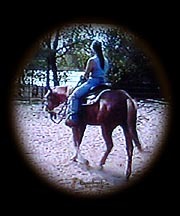 3-23-05 ~ Rode Zackery for the first time. He was great. Head down and relaxed. First he just stood there. Then as I picked up the reins and asked him to give to the bit and clucked he would take a step or two. Then we repeated in the other direction and back and forth till he finally started walking pretty good. 4/08/05 ~ 4th ride. Today I rode him with a bozal he is doing great. He learned to trot today. Videod. 4/10/05 ~ 5th ride. He is very lazy. So far I have to keep urging him to keep walking. Or trotting. He will get better. He doesn't get excited about anything...bumping his sides etc. 5/6/05 ~ 10th ride. Worked on giving and moving hip in circle. Finally got him to walk all the way around the pen and not try to come off the fence. Also got him to trot and keep trotting all the way around several times in both directions and staying on the fence. His head was down and he was relaxed. Also worked on stopping and backing with shoulders up. 5/8/05 ~ RPR...advanced halter backing. Then walked to bottom at the halter since he had only been there once a long time ago. He was quite antsy and cocky, not wanting to do what I asked of him. Wanting to charge over the bridge, paw at it etc. Went back up to the rnd pn and did some more RPR. Then went back down to bottom and he was pretty good at first but after a while he got his second wind and started being a little defiant again. I'm sure if I bring him down every day he will get better. He is good in the rnd pn and up at the barn area. 5/9/05 ~ 11 & 12th ride ~ Rode Zackery twice today. In the morning worked on walk and trot and stay on fence. At times he just stops and will not budge. In the evening worked on the same thing but I rode with a crop and kept him moving...he was pretty good then. He is quiet and relaxed with head down as he is going. 5/10/05 ~ 13th~Zackery is working very good loose in the Rnd Pn. Start out with walk...then ask for trot. He is reasonably quiet and pretty slow. Then the lope...it is nice and slow and relaxed. Then we turn and go the other way. He was very good and quiet under saddle today...giving to bit very well. He did try stopping several times at the trot and balked about going again. So I turned his head and got him to move his hip around then we would get going again. I think he thinks I am going to ask him to stop so he stops on his own. He does stop very well and rocks back when I ask for the stop. And he is going around and staying on the fence more willingly at the walk and trot. Also asked to give to bit while walking along fence mostly to the outside but some to the inside. He is giving and dropping his head quietly. Way to go Zack!!! 5/11/05 ~ 14th~Worked in Bozal today. More walking and trotting in pen. He is still stopping when he wants to at the trot in the beginning...then finally I can get him to go all the way around several times both ways. Asked him to go across the pen at the trot and go the other way several times...he wants to stop in the middle. He will figure it out. 5/12 ~ 15th~Same as yesterday. Used a quirt today to keep him going. This evening did ground work at the bottom and going in and out of trailer. He is just a little nervous in there but he walks right in and backs right out. Went over bridge real good today. He was antsy at first heading down the driveway and was jumping and balking...did some WESN lesson at trot then walk...he was pretty good after that. Then I tied him to the trailer and left him there for a while. He needs to get used to this for when I start hauling him. 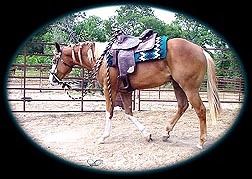 5/13 ~ 16th ride ~ Worked on back up Parelli style from the ground. Then worked him on a short lunge both ways. Then saddled and put bozal on. At first he was being silly and kept wanting to back up when I went to put the end of the reins on the horn, so I had to make him go forward in small circles around me again. Finally under saddle I was able to keep him going quite good at the walk and the trot along the fence. Also occassionally turned through the center of the pen and went the other way. He slowed through the middle at first then kept going several times. 5/14 ~ seventeen ~ bozal -Walking and trotting good...staying on fence good. Giving to bit to outside while walking pretty good. Trotting through middle and turning the other direction pretty good. Gives and moves hip over very good. Stops on whoa and backs very good. 5/16 ~ eighteen ~ bozal - Same as yesterday plus I asked him to lope for the first time. He trotted fast at first then picked up the lope and was relaxed about it. asked him once going each direction & continued about half way around the pen. He is figuring things out and doing pretty darn good. Way to go Zack!!! 5-20-05 ~ nineteen ~ Worked in snaffle. walk, trot, and Lope along fence. Turning nicely at trot through the middle of pen and going either the same direction or the oposite. 5-26-05 Just did ground work in Rnd Pn. Walk, trot, walk.... Trot, lope, trot. Getting very good at it. 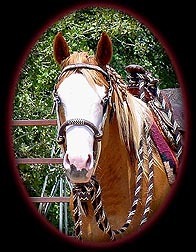 5-27-05 ~ twenty -snaffle. walk, give to outside and then turn. walk, give to inside then turn around cone. pretty good. Trotted and stayed on fence while giving to outside. Lope a few times around both directions. At first he tried cutting across pen. Doesn't pick up lope right away but does lope nice once we get going. 5-30-05 ~ twenty one-bozal. Walk and turn towards fence. Then walk, give and turn to inside around cones. Trot and start turning around cones...doesn't keep trotting in turn. Lope along fence continue several times around then get in trot and cut thru center and trot the other direction, lope repeat several times. Not too bad. Is getting into the lope a lot sooner and is slowing and relaxing more. His walking and turning around cones is getting pretty nice, with body language. 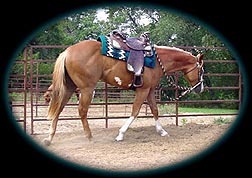 6-1-05 ~ twenty two -snaffle - Was just going to walk, trot, and lope perimeter of pen. He did not want to trot nor give to the bit to the left. When I did get him to trot he would stick his nose out and up in the air and ignore the bit. I had to get off several times and do a little RPR. The last time I tied his head slightly to the left and asked for the walk, trot, and lope...with some small circling. Then got back on and just walked while giving to the bit and turning to the inside alternating with turning to the outside. Much better. 6-6-05 twenty three ~ bozal. worked on getting him to lope and keep loping. Did not want to go so had to get off and work loose in pen. Also work on giving and turning. 6-7-05 twenty four ~ bozal. giving and moving shoulder over. (have been doing ground work with handle of whip to get to move hip or shoulder over) Also work on loping and continue to lope. 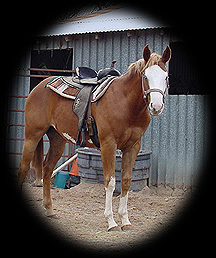 6/17/05 ~ Twenty sixth day under saddle since march 23rd.~ bozal- Zackery was great today. Lots of trotting and staying on fence. Also loped great and relaxed...slowing and continuning loping. Head comming down. Is turning real well at the walk and trot. moving hips over nice and crossing over in the front end while turning on the haunches. 6-20-05~ day 27 - bozal- lots of trotting and loping. Turning good at the trot on light cues...turning my own body in direction of turn. Then hauled to Jills and he was much more relaxed there this time but gets very swetty in the trailer before we get there. It is only 1 mile away. Just left him in a pen while I worked other horses. 6-22-05 ~ day 28 - hauled to Jills this evening. Worked in Rnd Pen. Saddled and rode in Rnd pen at walk, trot, lope. Then went out to riding area. Worked at walk and trot. Turning, doing circles, going over logs. He went werever I asked him to. He is giving his hip very soft at the stand still both directions. Head down and no arguing at all. He was nice and quiet and AWSOME! 6-24-04 ~day 29 -snaffle. rode in Rnd pn. 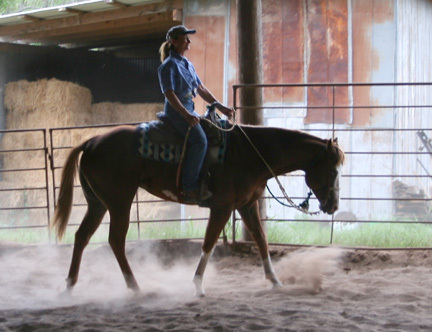 Walk, lift both reins and aim towards a certain pole. He did great finding the center between the reins and standing up at the shoulder. Also did this at the trot. Did some loping and he is getting better at staying on the fence. He definitely stays on better going to the left. All in all he was good. He is turning real well with just body language. 6-26& 27-05 ~ Day 30 & 31 - snaffle.Rnd Pn walk, trot, lope. very good. Walk and turn to inside while moving hip out. Then pick up outside rein, apply outside leg, sit back and move shoulder over crossing in front...pretty good the first day a little better the next. 6-28-05 ~ day 32- Bozal- Hauled to Martys. Saddled him and walked him around a little. He was doing a lot of hollering at first. Put him in the round pen and worked a little. He was listening good and did all that I asked. Then got on him and asked him to walk the perimeter. asked him to turn and go across to the other side. He was great. When the other horses walked off he started hollering again. but still did as I asked. Each time he hollard I would turn him first one way then the other. Also asked him to trot and turn across the pen and go the other way. He was very light. Tied him to trailer and went to lunch. After lunch I saddled him then led him around the perimeter of the arena once both directions. Then put him in Rnd pen again and worked on the same thing as earlier plus lope both directions. Then went out to the arena. I rode him on this end just walk and turn. Each time he hollard I would turn him back and forth. He was not hollaring as much now. Worked on the Todd spin exercise. Turn to inside while move hip to outside then stop and move shoulder to inside and cross over in the front. ( like the clock exercise) He is getting very good at this. Then we went and unsaddled and went into the barn for a rinse off. He was very quiet then. Very quiet in the wash rack...what a gentleman. 6-29-05~ day 33- snaffle- worked in rnd pen, walk, trot and lope. Clock exercise. 7-12-05~ day 34 - snaffle- His trot and lope were very nice today and he continued on the lope without much urging. it was slower and more relaxed. He does not argue when I ask for the turn and is turning and moving his hip and shoulder on light cues....way to go Zackery. 7-14 ~ Day 35 ~snaffle - Worked on the same stuff. Zackery was very lazy today. We did do a little more loping than usual. He might as well get used to it. 7-22-05 Day 36 ~snaffle- Lots of loping and keep on loping to relax. Doing pretty good today. Some trotting and stopping and backing. He stops good but needs to lift his front end and get his hind end under him. The trotting, stopping, backing is helping. Also did some loping and stopping, turn the other way, lope, stop, back, etc. 7-23-05 ~Day 37 ~ bozal- Hauled to Seguin to ride in warm up arena durring paint show. He was pretty darn good for being only two, still being a stallion, having only 36 previous rides under saddle and being around all those horses in that strange place for the first time. Way to Go Zackery!!! He did do a bit of hollering at first and each time I would back him up from the ground or go in stupid little circles from the saddle. After a while he got more and more quiet. First I took him in the arena and asked him to trot a circle around me at the end of the lead with the bozal then stop and go the other way several times. He was listening good. Then I got on and asked him to stand a moment or two. Then we proceded to walk and turn in serpentine fassion. If another horse came too close he would stop and stare at them. I guess he thought they wanted to visit. He was still paying attention to me and I urged him on. After a while we started to trot and trotted serpentines, figure eight, large circles etc. He was following my body language pretty darn good no arguing about where I wanted to go except for the occassional wanting to check another horse out. I was also able to get him into a lope for about half a large circle several times. This is the first time for a lope outside of the round pen. Once while we were trotting a large circle another rider came loping by and darn near ran into us and Zackery got a little excited and squeeled and wheeled around...I immediately made him go in a small circle while giving his head and moving his hip to the outside. He was fine. All in all I am proud of Zackery for his first time out around a bunch of horses. After riding I tied him to the trailer for a while and gave him some hay. I thought I heard him hollering every once in a while but when I got back to the trailer he was relaxed with his head down and it was a stallion at the trailer next door doing all the hollering. I led Zackery at halter for a final walk around the outside perimeter of the arena so he could see all the commotion and horses going by. He was very quiet, slow and his head was down and he was very relaxed. Awsome! 7-24-05 ~Day 38 under saddle - bozal. First worked loose in pen at walk 10 steps, trot 12 steps, walk 8 steps, turn towards me, walk back to the starting poing, turn towards me, repeat. 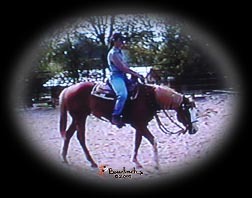 Then worked on trot half way around pen, lope once or twice around, trot half way, turn towards me, trot half way, lope etc. He listens to verbal cues as well as body language very good. We then went to the bottom to my riding area and I lead him around the perimeter once in each direction. He has not been down here since May 12th when he was a little antsy. Today he was quiet, relaxed, with head down as if he has been comming here all his life. After walking both directions we went to the bridge, he walked right over, nice and calm head down, no hesitation at all. Then asked him to trot around me at end of lead on bozal a little in both directions. First time for Zackery to be ridden down here out in the open...there are no fences. We worked on giving to bozal, moving hip over in both directions. Then walk serpentines and circles. Then trot circles, cut through the center and trot a circle in the other direction. At first he would come out of the circle in the direction towards the house but after a while he figured it out and was guiding quite nice. He is doing great. 7-26-05 ~day 39-bozal - hauled to Marty's. He was much more quiet today. Only hollared every once in a while...but not while I was on him...only from the ground. first worked him on tthe end of the bozal lead at the walk and trot both ways. then lead him around the perimeter of the arena both ways. Unsaddled and tied to the trailer a few hours. Then worked at end of Bozal lead again. Under saddle asked him to give to bit and move hip over in small circle at the walk and trot. Trotted circles, and serpentines. Loped a little he felt like a little hoppy rocking chair. this is only the second time I have loped him outside the round pen. He just hasn't gotten it all figured out yet. All and all he was good and was paying attention to all that I asked of him. His trot was a bit faster today than normal. 7-27-05 ~Day 40 - bozal- worked on walk, stop, walk, stop...then walk, trot, walk, trot...then lope and keep going several times around, stand up in the shoulders and guide, stop, back, turn to the inside or out, lope in opposite direction repeat. 7-28-05 ~ Day 41 -snaffle - rode him twice today. Worked on same as yesterday. 7-29-05 Day 42 - snaffle - rode twice. worked on give and give hip. Then walk and give to inside, trot give to inside, walk, give go through center and trot opposite direction, repeat. Then trot give to inside, lope and give to inside, trot, give, trot through center, lope opposite direction, repeat. The second time worked on trot, rollback to fence, lope ten strides, trot, rollback, repeat. He is transitioning down very well with seat cues. Day 43 ~8-2-05 -bosal- Hauled to Marty's today. Wow he was great. only hollard twice. once from the ground and once under saddle. He did everything I asked of him. First we walked the perimeter of the arena once around both directions. Then we started trotting the perimeter then did some circles and serpentines. He was slow and relaxed. Giving flexing and giving to hip pressure. Then we even loped a few circles both directions. First to the right. At first he would go half way around and then get into a trot as I asked him to come off the fence and circle across the end of the arena. But after a few times he kept going like a champ. Then we went to the left. He picked up the correct lead the first time. He has been having trouble with the left lead even in the round pen. He kept going and circling great from the very begining in this direction. Zackery I am so proud of you! He then stood quietly at the trailer like the gentleman that he is. Day 44 ~ 8-6-05 snaffle ~ Worked on walk, trot, lope. Lots of loping. Trying to get him to pick up the left lead going to the left. He wants to keep picking up the right. Day 45 ~ 8-7-05 snaffle ~ worked on walk, stop, indirect turn to the right. Then trot, stop, indirect turn. Loped only a few times. He was more relaxed and slower today. felt more collected at trot and lope. Day 46 ~ 8-8-05 snaffle ~ Worked on same as yesterday. Wow his pivots are great. His stops are super nice. He actually picked up the correct lead several times to the left. If he picked it up wrong I would quickly turn him to the fence and then back and ask for the lead again...he was good. Stopped really fantastic from the lope to the left....wow. Getting very light. Day 47 ~ 8-11-05 bosal ~ Hauled to Valley View. lead him around perimeter. Let him look at the painted horse silhouetts on the wall and check himself out in the mirror. When he first saw himself in the mirror he wheeled around and started to run the other way. He was fine after that. Under saddle he was calm and relaxed and did all that I asked of him. walk small circles and move hip out, then move shoulder over to the inside. Trot serpentines and circles. Loped a few circles in each direction. It took him only a few tries to pick up the left lead. He was great. He does exhibit slow deep hocks. and a reasonably relaxed lope. Day 48 - 8-14-05 snaffle - Hauled to Jill's. Worked on walk, stop, back, indirect turns repeat. Trot, stop, back, indirect turns, repeat. Lope, stop, back indirect turns, repeat. 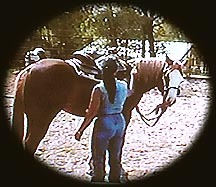 Also walk and trot circles while give to the inside then turn and go through center. Lope circles. Day 49 - 8-16-05 bosal - walk, trot, lope, turn, circles etc. Then walk and trot along fience both directions head down. Very good. Snaffle - all of the above. Day 52 -Aug 22,2005 -hauled to Jill's with Leroy..good together. Snaffle mostly in rnd pn, lope, and indirect turns. He was bad today. Did not want to do too much...kept freezing up on me...very lazy. Day 53 ~ Aug 24 -Hauled to Jill's with Leroy...even lead them together...great. Guiding exercise at the walk. Cone work at the walk and trot. Lope a few circles and around the perimeter. Did not want to stay at the lope to the right...kept trying to veer off into the woods. Is picking up his left lead a little better...especially after moving his hip around then bend his head in same direction. August 28 ~ He got some well needed round pen reasoning done this morning. He was getting a little pushy and nippy in his stall. He has been very good since. Day 54 ~ Aug 31 ~ hauled to jills - snaffle- OK...time to start refining cues. Worked trot, and lope a few times around in pen. Then Cone exercises outside to warm up. Then worked on walk and stop cues through the woods. He was very good. Will be working on this till he is consistant. Day 56 ~ Sept 3 ~ Worked on walk, trot and lope a little both ways of the pen. Reviewed walk-stop trasitions. Started work on walk-trot transitions. He was very good. Day 57 ~ Sept 6 Hauled to Marty's- bosal - Worked on small circles. practiced walk - trot transistions. Then trot big circles, walk, cut through center and trot the other direction. 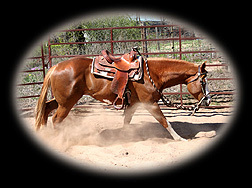 Also Lope circle, trot, cut through center and lope other direction. Then trotted the perimeter and worked on relax and go slow with head down. He was great. Later went out back and worked on teeter totter bridge and also standing with all four feet on low pedistal. He finally figured it out. Day 59, 60, 61 Sept 15, 18, 19 Trot on fence, turn to outside, lope a few strides get back to trot, turn, lope, repeat. Gets a little in a hurry at the lope at times. Also worked on trot-walk transitions. slowing at the lope and turning very good. Day 63 Sept 25 Trot turn lope, trot turn lope repeat. also walk, give to inside turn through center walk oposite direction. Also at the trot and a little at the lope. He was pretty good today. Day 64 Oct 1, 2005 Walk, trot, lope, stop, indirect turn, lope, stop repeat. walk, stop, walk, stop,trot, stop, trot, stop, lope, stop, lope, stop, repeat. Day 65 Nov 5 ~ Snaffle ~After a one month break we worked on walking small circles, moving away from leg pressure, giving his face to the inside. He was very good.